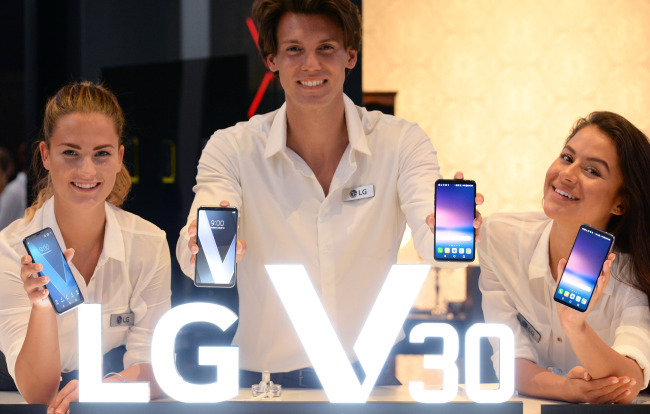 LG Electronics may introduce an upgraded V30 smartphone with improved artificial intelligence features at the Mobile World Congress slated to open on Feb. 26, according to the industry Friday. Instead of a new model of its flagship G series, which used to be presented every February or March, LG is expected to announce new technologies and functions added to the V30 smartphone, which was launched last September. The new version could be named “V30+‘α’,” according to news reports. The V30 smartphone provides Google Assistant’s Korean language service. Considering LG’s increasing partnership with Google, the upcoming version is likely to feature Google Assistant-based AI functions. Such a plan is interpreted as part of LG’s new strategy to retain existing premium models for a longer period, as its CEO Jo Seong-jin said at the Consumer Electronics Show last week. If LG announces a new V30 smartphone at MWC next month, the launch of the G7 could come after several months. LG CEO Jo has ordered a revision of the G7 smartphone from scratch, though it was highly expected to debut at MWC in Barcelona. A public relations official at LG confirmed some new features would be presented at the event, but added that which product would be announced has not been decided.